If you aren’t paying close attention (or playing Daily Fantasy Baseball and enjoying his $2000 price tag on DraftKings while it lasts), you might be missing what Jimmy Paredes is doing right now in Baltimore. 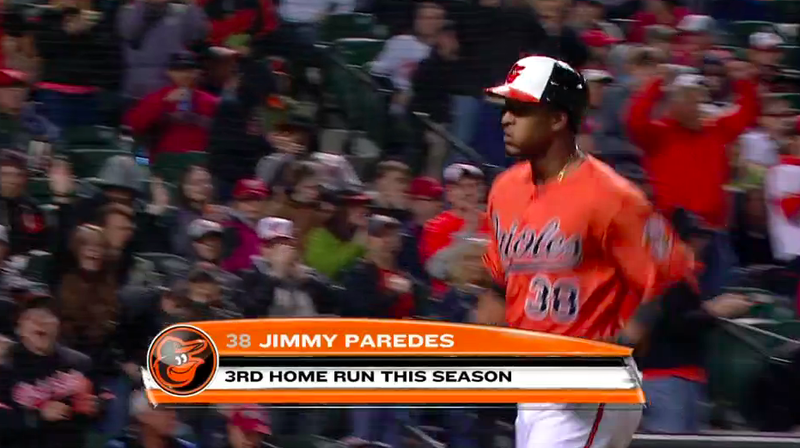 There’s a little magic going for this guy in Baltimore right now – and a little magic happened tonight when I was texting my buddy Corey about Mr. Paredes and his phone auto-corrected to ‘Jimmy Paradise’. Every now and again; when you’ve been playing fantasy baseball long enough and watching baseball long enough, you can tell when something magical is about to happen. It struck me tonight as I saw Paredes get four hits at Camden Yards (including a bomb that gave the O’s the lead) that the man that NO ONE in the Fantasy Baseball community had as any type of a sleeper just might be the biggest of them all out there right now. He’s 26, he’s had pretty good minor league numbers; there are sites that probably will soon grant him multiple position eligibility, he hits in the middle of the Orioles lineup at a park that seems to manufacture career seasons. What is not to love about Paradise? ← Previous Story Hard Hittin’ Mark Whiten Memorial Player of the Week: Caleb Joseph?